Want to learn more about The Witchwood ? Head on over to our The Witchwood guide! Join the discussion on our forums! Come discuss Bewitched Guardian over in our dedicated Bewitched Guardian discussion topic. While this is a Twilight Drake that costs one more and has taunt I still don't think hand druid is going to be that great. This card begs the question, why would run this over Twilight Drake? Which begs the question, why not both? You can bet that the design team are working on the assumption that any deck running this also runs Twilight Drake. Renounce the Willdness : Change your class, Druid cards, hero power and deck to Warlock after this match. Love the art! Really screams that chunky stylized armor that Blizzard always loves to showcase. Looks imposing as a tank! 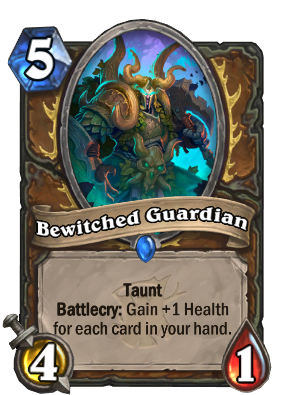 its should be 4 mana otherwise it is bad. It's could be a good card for warlock, but as a druid's card it's look pretty weak. More fodder for Hand Druid. Decent card. Just not sure if they archetype will pan out. Hadronox returns cards in their original state, so this would only be a 4/1 Taunt if that happened. Honestly I'd prefer a 1/5 Taunt over that. Druid has draw. Amazing draw in fact. But it lost nearly all of its ramp potential. So its going to be turn 10 more often than turn 5 when it maxes out its mana. Ramp that has been core to the class for the past year is next to gone. It and Mage might be tied for last place. Only thing left might just be big/quest druid. I’m starting to think that the plan is to offer so many silence targets that aggro opponents can’t tech hard enough to get through. I think they're part of the same strategy. Always something hard to remove.